05.30 – Alarm goes off. Mummy reluctantly emerged from under the duvet. George and I – a little confused all night. We saw the usual regular bag by the door, we saw Mummy packing our food … not sure where we’re off to this time. We didn’t even bother to sleep on the bed – so much uncertainty in the air. But Mummy eventually did get up and went into Auto mode (earlier than usual). Fed us, washed up, got dressed … and out came our leashes. 06.00 – Out the door for morning business. Mummy’s getting good at this. She walked us at 9pm last night – to anticipate us having to “go to the toilet” earlier than usual. And she has found this quiet street where she let’s me off the leash – and I would go immediately. We hurried back home and within minutes we hear the low, deep Gett Taxi “BEEP” and immediately we went into a frenzy. We’re going somewhere! We’re going somewhere! Where? Where? 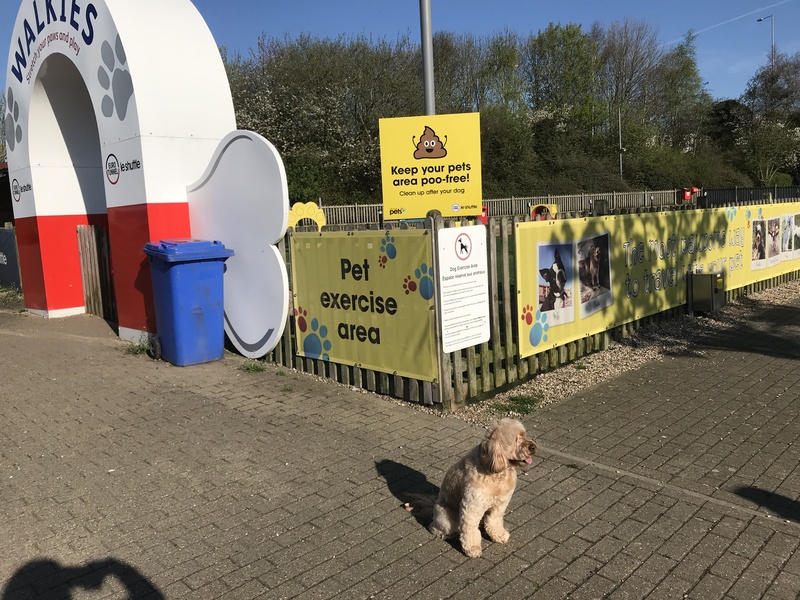 06.30 – We pulled with excitement going down the stairs which wasn’t very helpful for Mummy as she was loaded down with (regular sized) roller bag, a backpack of all our food, etc, and two leashes to manage. 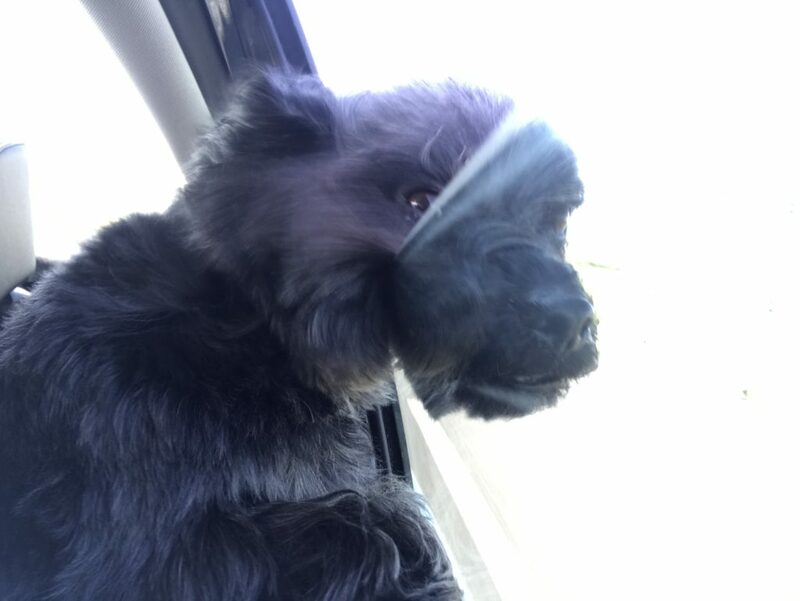 We jumped into the taxi and George jumped onto Mummy’s lap – and began to pant. Sigh! Here we go again. I know it bothers Mummy and George doesn’t know what to do with himself. 07.00 – We arrive at St. Pancras International station. Mummy collected our tickets and went to the Platform. 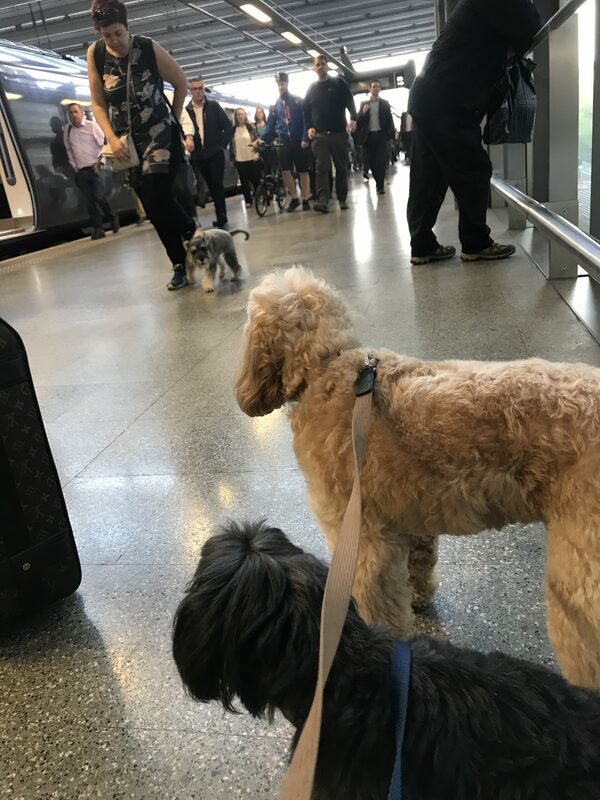 It’s the morning commuting hour and as the train pulled into St. Pancras International, hordes of people emerged from the coaches and flooded onto the platform, It was a sea of people – and a dog that barked at us. Whatcha barking at Mr. Schnauzer? When the platform cleared, we boarded the 07.25 train. 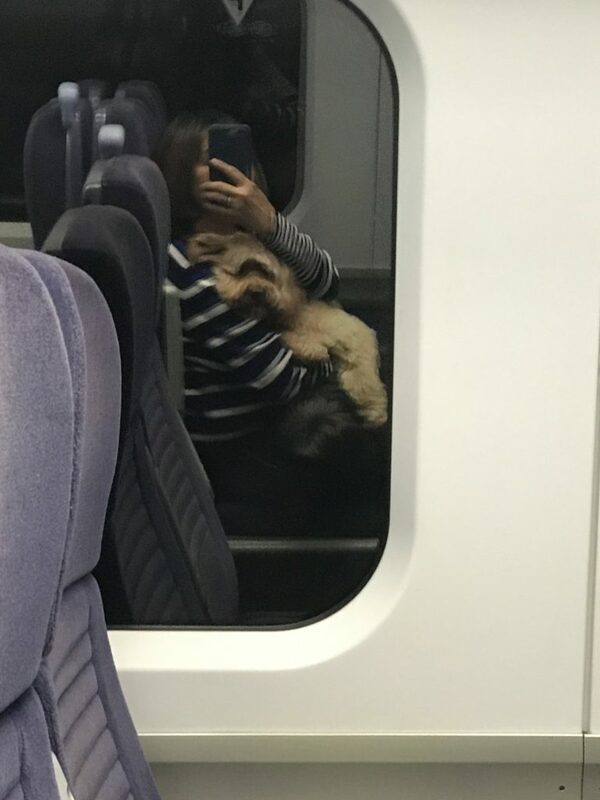 07.25 – The train departed and I decided I wanted a cuddle with Mummy. I don’t usually ask as it is always George who gets to sit on her lap. But on this train ride, I wanted my time. And George wasn’t going to relinquish his place – so we both sat on Mummy’s lap on the 48 minutes ride to Folkestone West. 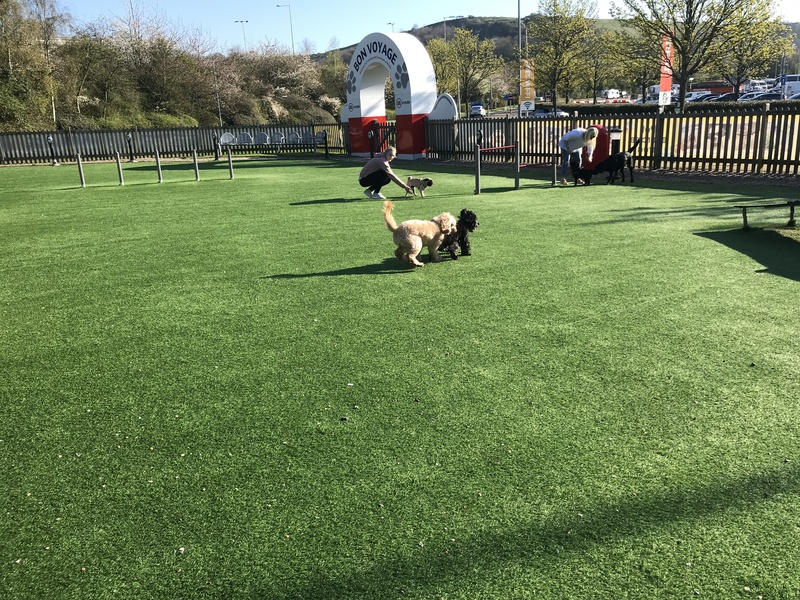 – a chance to stretch our legs as we played and ran over some of the agility equipment All this is looking familiar. So where are we going? Aha! 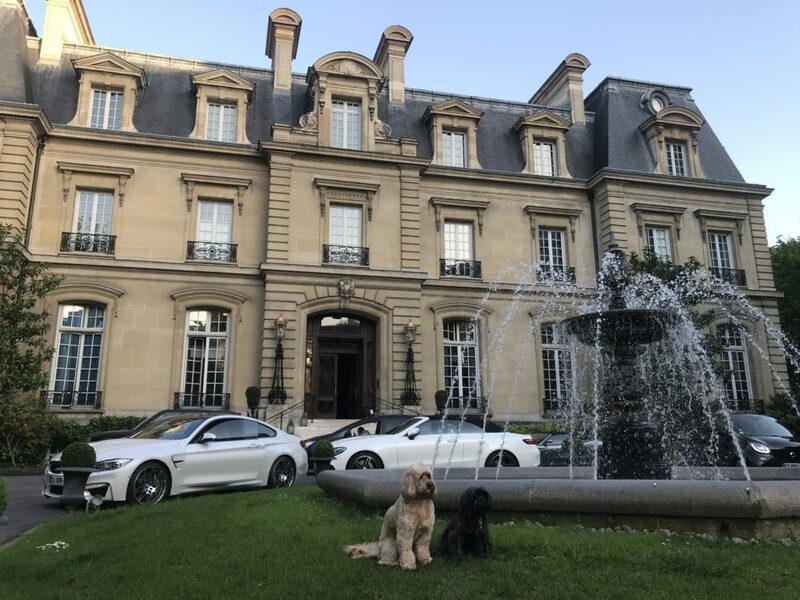 We’ve been to France before but this is George’s first trip to Paris. 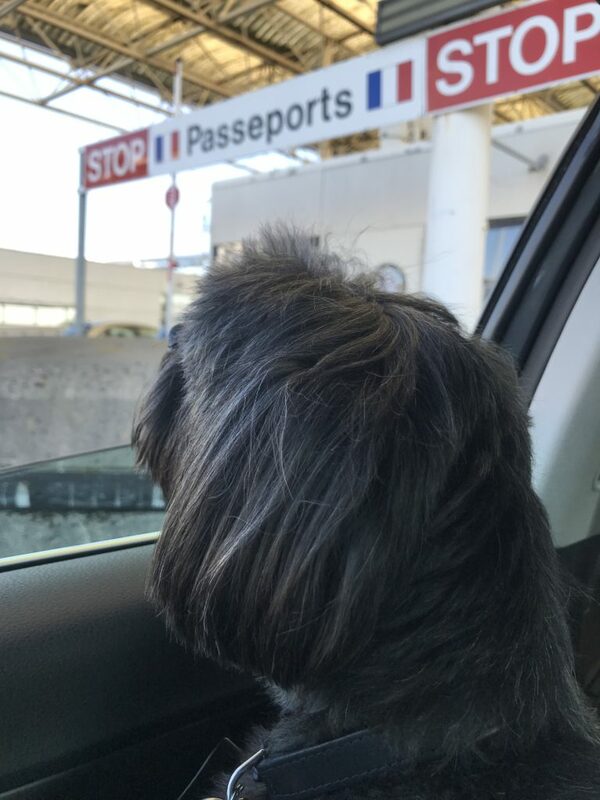 Back in the car – and it was time to cross borders. But they didn’t care to see our Passports going this way – only when we’re going home. 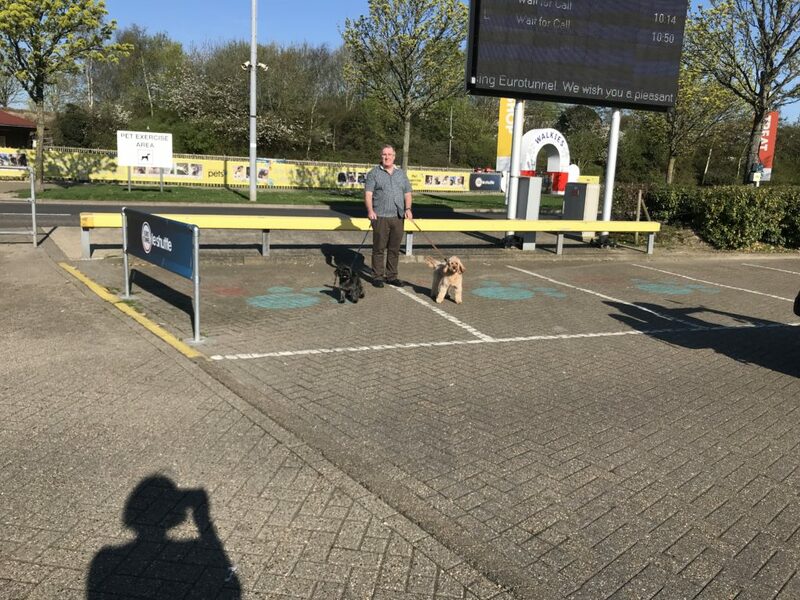 09.30 – We crossed the Eurotunnel and once out of it, we were on our way – and a three-hour drive to Paris meant a lot of panting. Mummy opened to window and when he stuck his head out the window, he was fine but there was no way he was doing that for three hours! 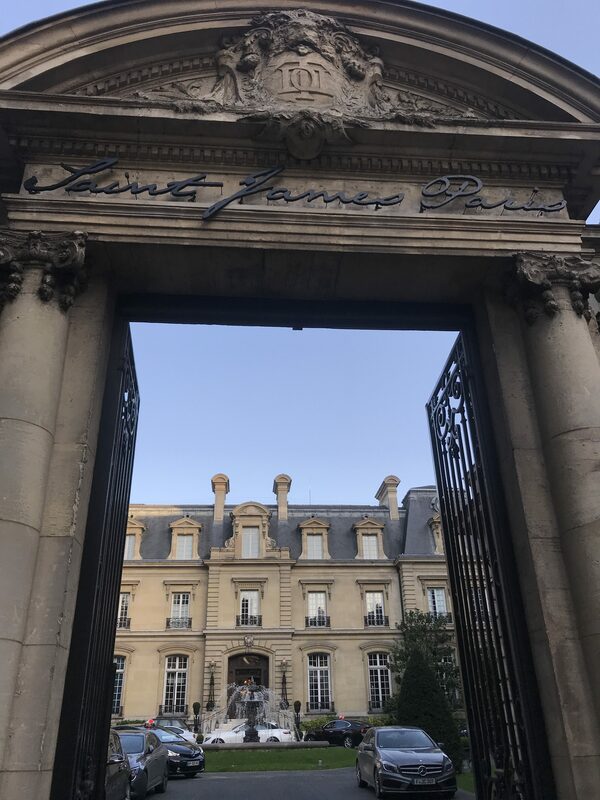 13.01 – Finally three hours after emerging from the Eurotunnel, we arrived at our hotel – St James Paris. Happily getting out of the car as the staff greeted us warmly. So glad to get out of the car! Now for some Paris adventures! 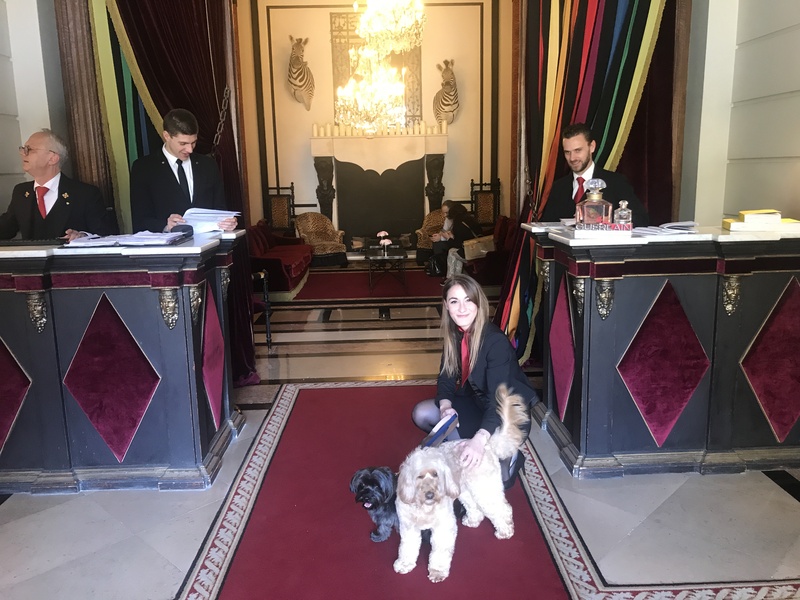 May’s comment: Rather unlucky with our travel dates … SNCF April train strikes meant I had to quickly change plans for a “Birthday Weekend” in Venice. There was no plan to stop over in Paris. We were taking the train all the way to Milano via Paris. Alas, it wasn’t going to plan. I can’t change my birthday and besides I just couldn’t let down a little girl in Milano who has been waiting for George’s arrival for months. 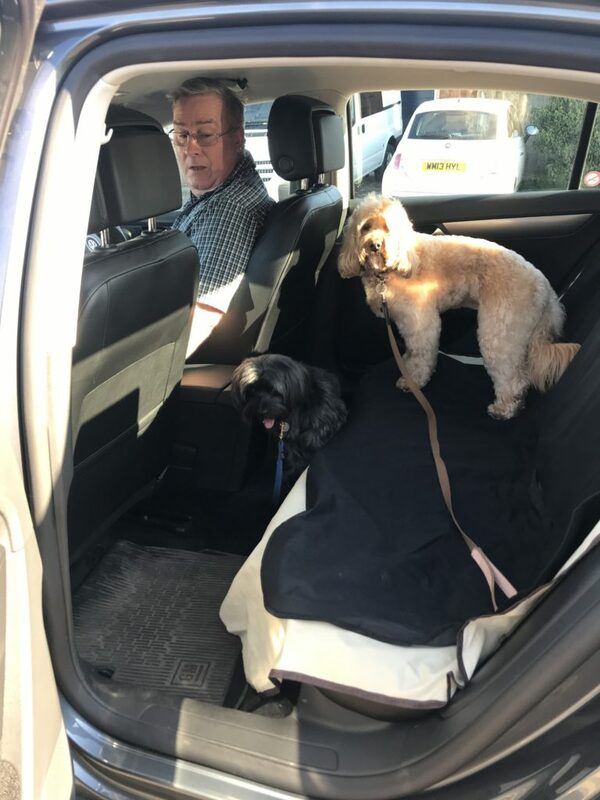 Folkestone Taxi – for those who are not driving, this is a great option. 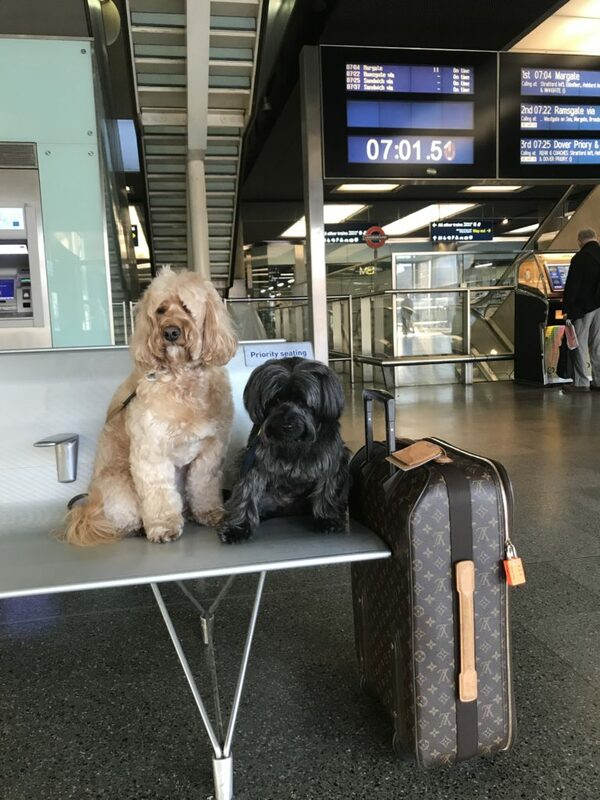 They are often called upon when people travel with their pets on the train crossing onto the continent. They can pick you up from Folkestone and drop off at Calais to continue the train journey. In our case today, with the SNCF strike, and dates to keep, we took the taxi all the way to Paris. What a luxury not having to get on a train at Calais and then getting off at Paris – not knowing if we can find a taxi to take us. 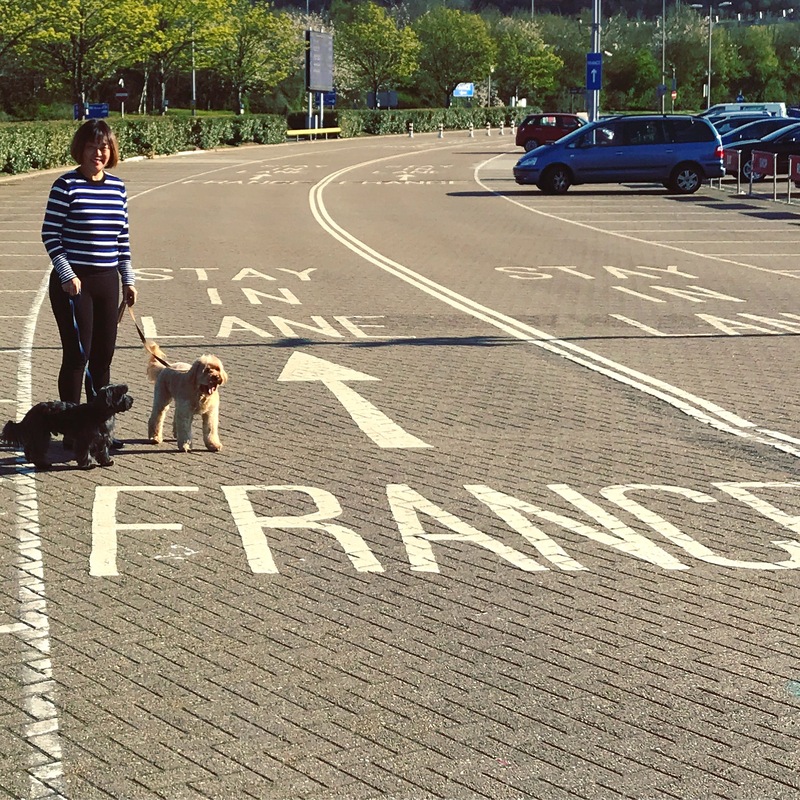 Eurotunnel – what life saver with no hopes of Eurostar allowing pets on board any time soon. I was hoping that My Taxi’s international network would work in Paris but it wasn’t. 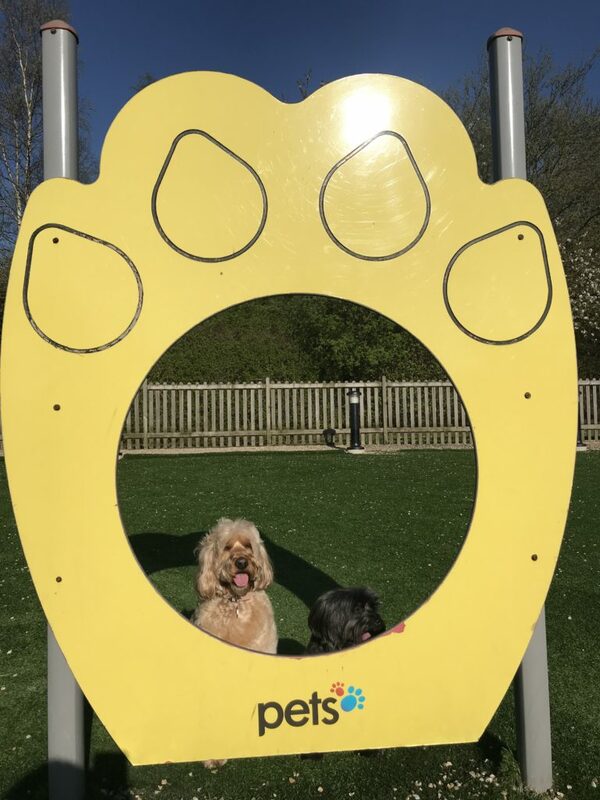 Hi May, it was lovely meeting you, Miss Darcy and Georgie today at the Belgravia Dog Show! Cristina I’ll email you – see if you can help me with a project.